During the summer, it’s overnight oats and in the winter, we usually switch things up with a hearty bowl of steel cut, Apple Pie Oatmeal and baked oatmeal for the kids. 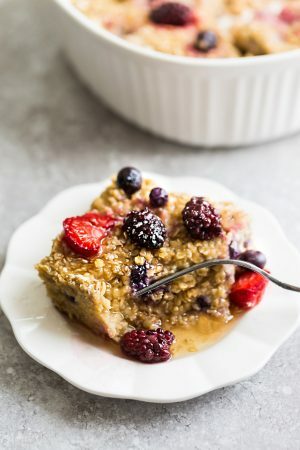 They already love this Apple Cinnamon, Lemon Blueberry and Berry Baked Oatmeal and this Pumpkin Baked Oatmeal is their latest favorite for fall. It starts off with the same base as my Cinnamon Apple Baked Oatmeal but we use pumpkin puree and pumpkin pie spice instead. 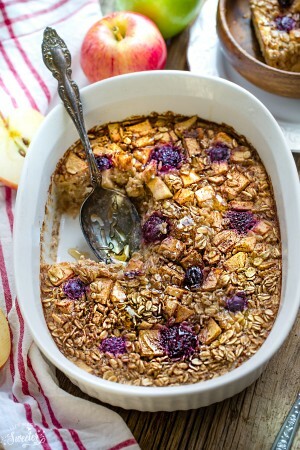 If you’ve never tried baked oatmeal before, you’re in for quite a treat! It’s so much easier to bake in a dish instead of cooking it in a pot. This pumpkin baked oatmeal also makes a hearty and healthy breakfast plus leftovers freeze beautifully. That means you can easily make a big batch and then reheat smaller portions throughout the week. 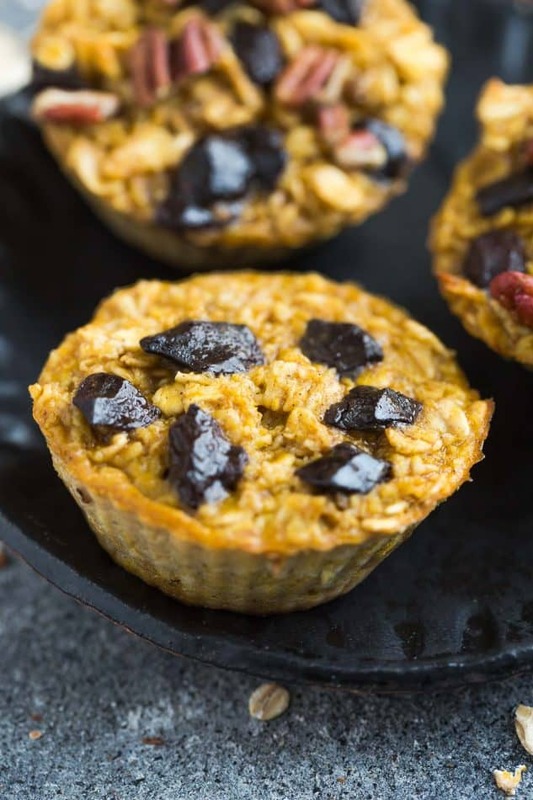 And you can even divide the batter into muffin-tins to make these easy grab-and-go oatmeal cups. 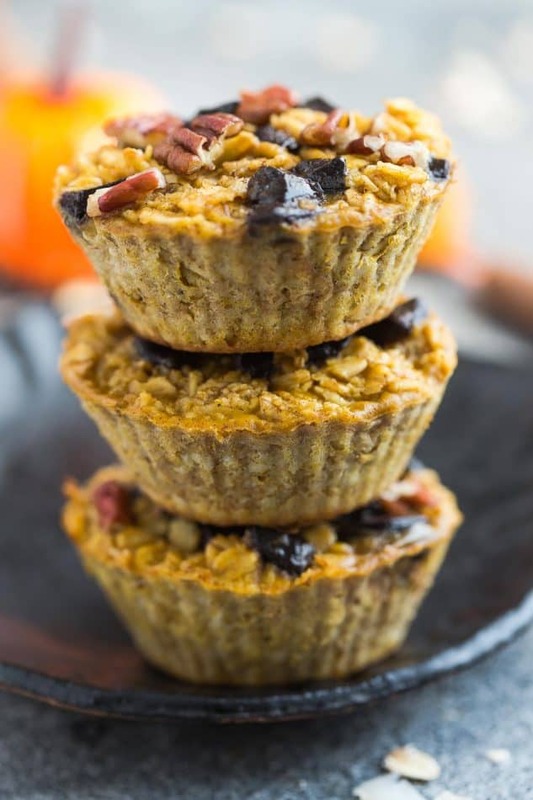 The oatmeal cups are perfect for making ahead and taking along to work or school. 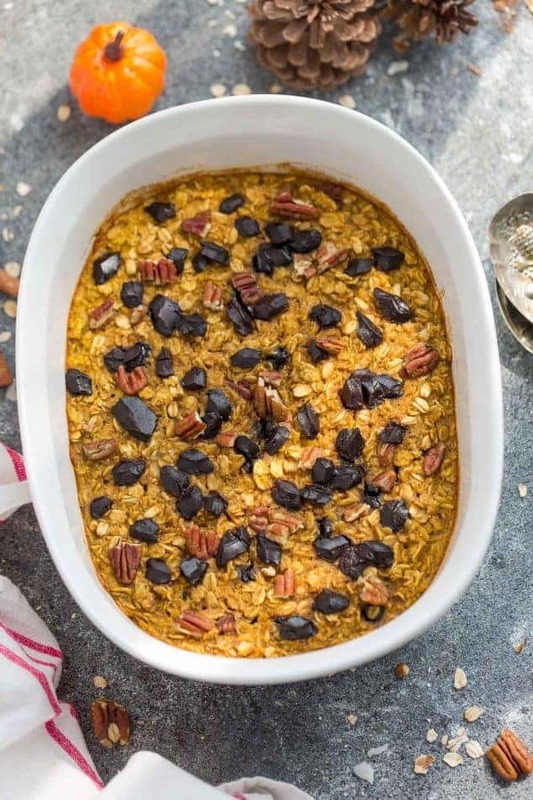 This pumpkin baked oatmeal is hearty, healthy, gluten free, refined sugar free and dairy free. 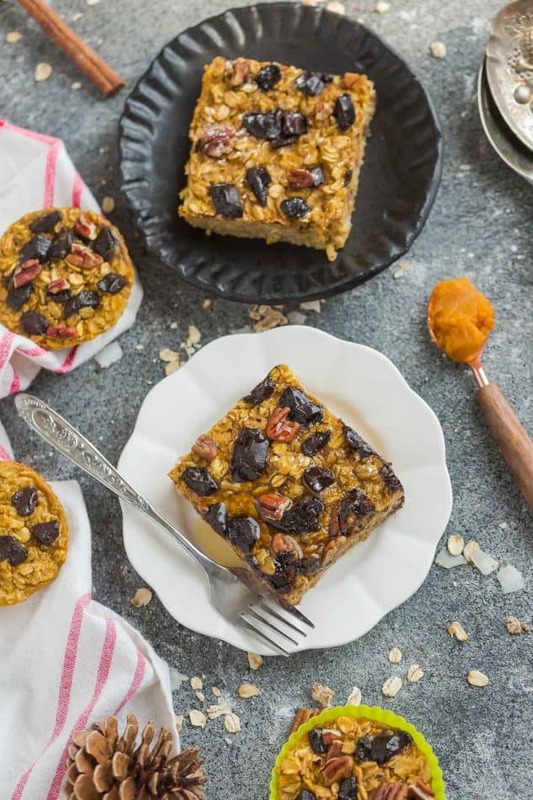 It’s packed with chewy oats, cozy fall spices and sweetened with maple syrup. If you’re not a fan of maple syrup, honey, brown or coconut sugar would work as well. Pumpkin Baked Oatmeal with Chocolate and Pecans - the perfect easy make-ahead breakfast or brunch for fall! Best of all, make them into oatmeal cups for on the go. Full of cozy warm flavors and comes together in just one bowl using healthy and wholesome ingredients. Gluten free & refined sugar free. In a large bowl, whisk the eggs and milk until combined. Stir in pumpkin, maple syrup, vanilla, pumpkin pie spice, flax seeds and baking powder. Gently fold in in oats and and then 3/4 cup of chopped nuts and chocolate. Spread batter evenly into pan (or muffin tins if using) and top with remaining nuts and chocolate. 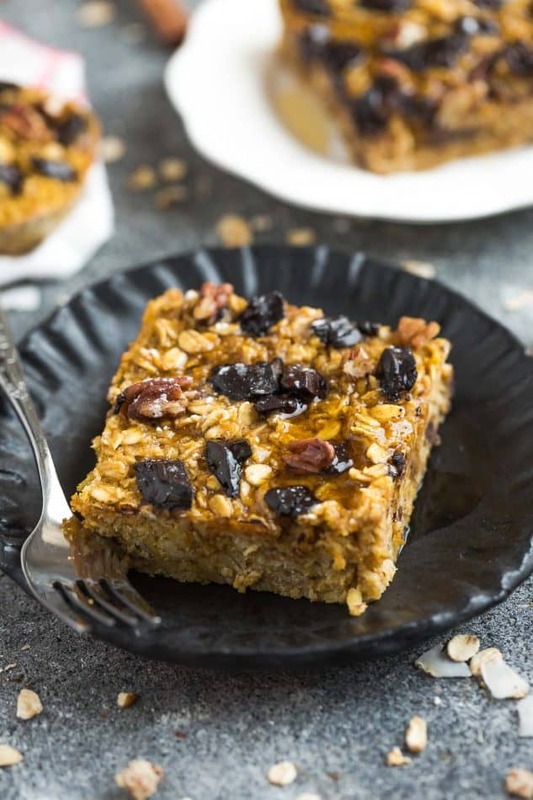 Bake in preheated oven for 35-40 minutes (25-30 for oatmeal cups), or until the oatmeal is set and the center is no longer jiggly or a toothpick comes out clean. Remove from the oven and serve with maple syrup and any other desired toppings.